This post is a mixture of things I have seen over the last few weeks and haven't had a chance to yet post about. It is late winter here in SE Queensland, Australia and the wildflowers are blooming. The Leucopogon are in blossom. This is a small shrub and the flowers are small but I think it has the sweetest perfume of all the wildflowers around here. Another flower I enjoy seeing is this orchid - common name Bonnet or Tartan Orchid - cryptostylis erecta. The colors of the flowers blend so well with the colors of the leaf litter on the ground that it is not an easy flower to find. It has been an exceptionally warm winter around here and my lawn and garden are needing a lot more care than they have been getting! The other day this little lizard came out on the concrete path after I had been doing some lawn mowing . It was lying down among the lengths of twine from the bales of mulch that I had been spreading. I thought at first it was a little Blue-tongued Lizard but when it stuck its tongue out it was red/pink. I hadn't known that there was a Pink-tongued Lizard ( or Skink I have been told it should properly be called). No matter what the season there are always some Pied Oystercatchers around somewhere. I have found that each pair of birds stays in their own stretch of beach. This pair seems to have taken over a territory that has been empty for a year or so. It will be interesting to see if they remain in the same place over the summer. and for birds visit Wild Bird Wednesday. the oystercatchers are such smart/sharp looking birds! LOVE the skink and his reptilian scales! and i like that beautiful orchid, too! Great shots of the flowers and birds. Yikes! That skink has quite the face:) Lovely Oystercatchers as well!!! A new one for me! Terrific captures for the day, Mick, as always! Such a beautiful orchid!! And I love your "marching" birds!! Thanks as always for sharing with us! Hope you have a great week! 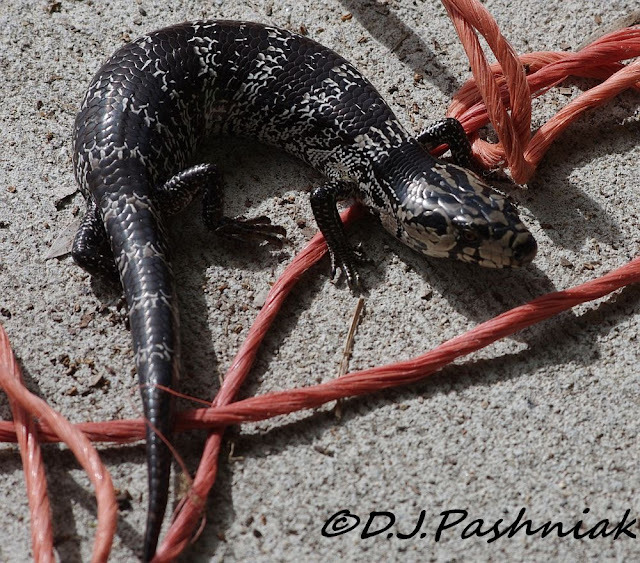 I like the patterns on the lizard mixed with the pale red twine. Not something I would expect to see in my part of the world pink-tongued OR blue! A lovely variety, Mick! The orchid is beautiful and the lizard is cute. And I always loved the Oystercatchers. Great shots and post. That's a cute lizard and great that he did not scurry away when you approached. I do like your header Mick and the shots of the Pied Oystercatchers too. Thanks for sharing your part of Oz (and for dropping by my blog!) Happy snapping. I like the word lizard better. Great post. Boom & Gary of the Vermilon River, Canadas. 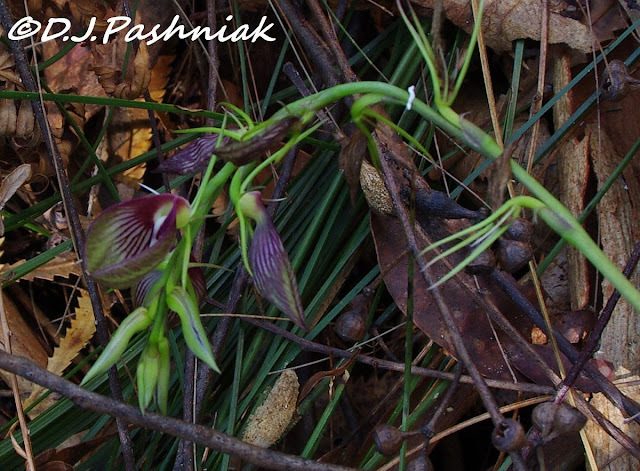 The orchid is beautiful and so is the Skink.The wild flowers should be nice this time of year. Beautiful orchid! Love the lizard, and the Oystercatchers are always a treat to see. I kinda like the Bonnet flower. My maiden name was Bonnett. 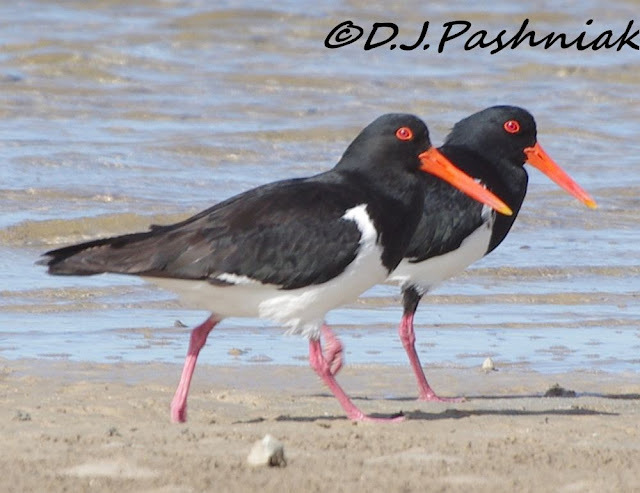 The oystercatchers with their vibrant beaks and eyes and pink legs that stand out against their black and white feathers are quite the handsome bird! Beautiful late winter in your neck of the woods! The oystercatchers are handsome as they march in step. I like everythig about the skink...from his name to his scales! So much to see and study closer in your serie of photos, well done! The oystercatchers have such "businesslike" bills. Guess they'd need to for what they choose to eat! You're a very observant photographer to spot all these interesting plants and creatures. Enjoyed the late winter tour. 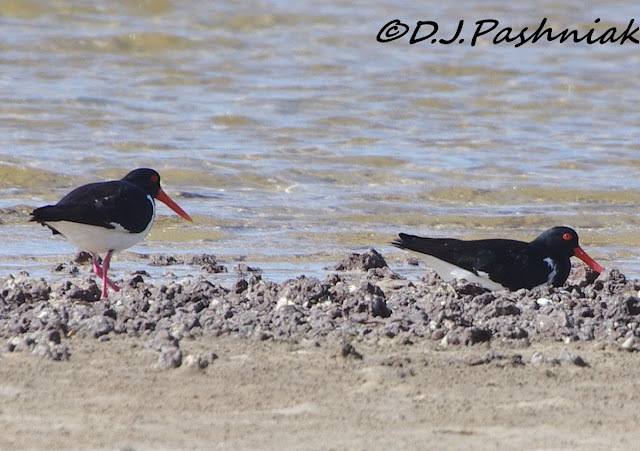 I like the oystercatchers you have there...so much more color than the black ones we have here. Did you know your profile picture is gone on your blogger profile, just the red x. Sometimes this happens when we remove a photo and we forget it it our profile pic and sometime we don't care about it. :-). Thanks Nora, I'll try to find "why" asap. I don't really enjoy setting up blogger - just enjoy using it! Beautiful photos. My favorite is the skink, he's very cute. Ah Black and White. Always something to watch when there are oystercatchers about. I may be a little while before the reptiles come out in Victoria! As far as I know we only have "American Oystercatchers" here. Your variety is super. And that lizard is mighty cute, actually. Great shots. I like the skink capture a lot. The skink is a beauty - such lovely markings. You caught the Oystercatchers in good light there, not to mention in action. Fabulous shots! Loved my visit to your winter Australian world today! Nice pictures of both flowers, lizards and birds, Mick! You mentioned you have Winter now in Australia, is it although warm temperature? No snow like we get in the cold north? Hi Pia, No snow anywhere near here! Summer is HOT and winter is comfortably warm. Great photos. Love the last one of the Oystercatchers. 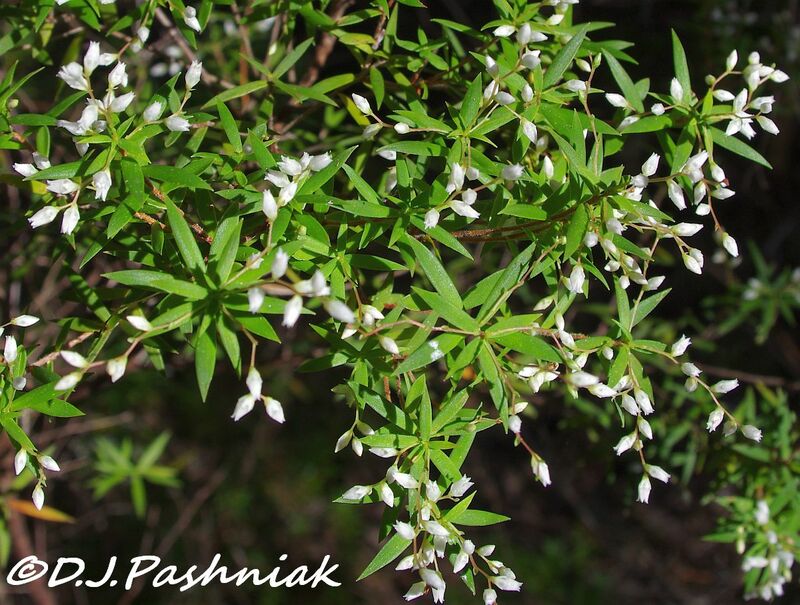 I like the shot of the leucopogon. It looks like it would be fragrant. Great series of shots, they are all colorful and amazing. I always smile when I see flowers blooming in winter. :)) Winter? But everything is relative, isn't it? LOVE the oystercatchers. I really like the Oystercatchers marching in step. What a great lizard/skink that is! Reminds me of a baby alligator. Very nice winter flowers, that orchid is a beauty! Hope you're having a great weekend, Mick! Heading out to the sod fields to search for migrating shore birds at sunrise. Come on along - I'll bring the coffee.